You’ve probably read many times that using a ceiling fan in a room saves energy and money. The wind chill effect fans create mean most people can raise the temperature on their air conditioner by 4 degrees without noticing any difference in their comfort level. This saves almost 10 percent on summer electricity bills, according to PPL Electric Utilities. There are several features to look for when buying ceiling fans. Read on to learn how to find your perfect cooling device. The number next to this acronym, which represents cubic feet of airflow per minute, is important. CFM represents the wind chill effect that makes people feel cooler. You generally want the highest CFM you can find for your appropriate fan so you can turn down the thermostat and save energy. A higher CFM may be the result of a bigger motor that requires more energy to run, but this is a very small expense compared to the cost of running your air conditioner. Look for at least 6,000-7,000 CFM for best results. While fans are not as big an investment as a new air conditioner, you don’t want to waste money. However, it’s worth the expense to spend more money on a fan with higher CFM and a better motor. A bigger, better performing motor can help boost the CFM but also reduce noise and wobbling. Since this is a device that may be running for several hours a day, you want something pretty quiet. DC motors are considered the latest and most efficient in ceiling fan motor technology – and also the most expensive. Motors larger than 200 mm are more affordable but still considered good quality. 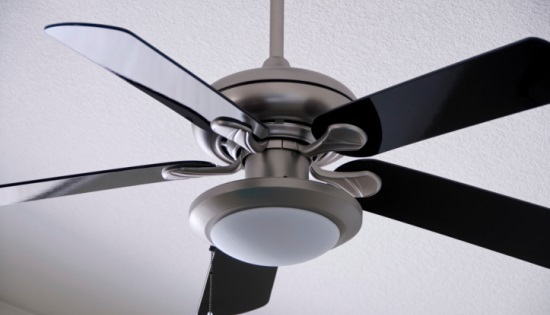 Blades are generally the first thing consumers look at on a fan. Whether you want sleek and rectangular mahogany blades or more traditionally shaped oak-colored blades, the number and angle of the blades is much more important to the fan’s functionality than their shape. Many fans come with four or five or even more blades. Many people assume the more blades the more air moved, but in fact more blades create drag. Three blades, such as what you see on giant wind turbines, are most efficient, but four or five blades are quieter and more aesthetically pleasing to the eye. The angle of the blades is also important. Anything less than a 12 degree angle is too flat to move air efficiently. Look for blades that are angled 12-14 degrees. Ceiling fans with the ENERGY STAR seal are usually about 20 percent more efficient than other ceiling fans. Models that include a light are generally 60 percent more efficient than other ceiling fan/light combinations. Also look at the watts of electricity needed to run the fan. Average is about 70 watts, so anything less is more efficient.